Set a hundred years in the future, Psycho Pass presents a world where all it takes is a simple brain scan to label you a criminal—regardless of whether you have committed a crime or not. Those who fail the check, but have yet to commit a crime, are called "latent criminals" and—if therapy and drugs don't work—are given a choice: jail or hunting down other latent criminals. Therefore, because of these scans, Psycho Pass shows an interesting future where "mental beauty" is as sought after as physical beauty. It is also a future where the police's job is little more than to watch the latent criminals they control—because if they did any real detective work, they might start to think like the criminals they are trying to catch and thus become latent criminals themselves. in this futuristic society. One case deals with a series of murders at a factory completely removed from the brain scanning network. Another deals with a murderer killing internet celebrities and taking their places. Yet another deals with young girls being dismembered and made into public works of art. All of these mysteries are excellently explored inside the framework of this futuristic world. And how the criminals manage to circumvent the brain scanning system each time is nearly as interesting as watching the police solve each crime. All these crimes—and the series itself—are tied together by a puppet master antagonist working behind the scenes. Much like the Moriarty character from BBC's Sherlock, the main villain of Psycho Pass is a "consulting criminal." While he rarely dirties his hands himself, he is the man working in the shadows to supply the murderers with the resources they need to get away with their crimes. In this way he is shown to be brilliant, competent, and more than a little terrifying—despite the ultimate failures of each of his murderous clients. Mixed — I AM THE LAW! 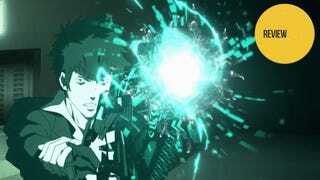 While no doubt Ghost in the Shell paved the way for shows like Psycho Pass, Psycho Pass seems to be more reminiscent of bad Sylvester Stallone movies than Ghost in the Shell. The police and their latent criminals all use a gun/portable brain scanner called the "Dominator." Much like the "Lawgiver" gun from Judge Dredd, it can fire different kinds of ammo and can be used to execute on the spot those who are judged guilty. The world itself, where even bad thoughts have been rooted out of society, is reminiscent of another Stallone movie, Demolition Man. However, while Psycho Pass may have much in common with these movies, it handles the subject matter far better than either of the aforementioned films. outsmarted the system or otherwise tricked it when it comes to himself. It's not that he works behind the scenes in such a way that he never technically commits a crime, nor is it that he has somehow convinced himself that he is not committing crimes and is therefore innocent—thus fooling the scanners. Rather, the scanners just read him wrong, no matter what he thinks or does. He doesn't know why himself. He just says that it has always been this way for him. It's just a straight up Deus Ex Machina: He is immune because the creators say so. And sadly, this makes the villain seem much less threatening. Sure he's smart, but not nearly as much as we had previously thought. Rather, he is just some guy with an arbitrary special power that lets him literally get away with murder. Psycho Pass is not a groundbreaking anime. It clearly draws from various other cyberpunk media to craft its world and story. However, that doesn't make it any less enjoyable. It presents a series of compelling murder mysteries set in an interesting future saturated with brain scans and holographic technology. It's dark, gritty, and action packed. If you like cyberpunk or murder mysteries, you will find a lot to like in Psycho Pass. Psycho Pass is currently airing on Fuji TV in Japan. It can be watched in the U.S. and subtitled in English at Funimation.com. Stay tuned to Kotaku East for the review of the second half of Psycho Pass later this year.